This entry was posted in guns, History and tagged gun lobby, gun violence, NRA, Ronald Reagan, Wayne LaPierre. Bookmark the permalink. Excellent. This picture is, as they say, worth a thousand words. That rationale – if one can even characterize it as such – argues against having laws against fraud or other robbery. After all, they don’t stop criminals . I congratulate you. That is the most brilliant argument for gun control I have ever heard. So now we can pull the armed guards away from President Obama. They did not protect President Reagan, obviously they are a waste of money during this time of sequester cuts. I really want the armed guards pulled away from his Highness Mayor Michael Bloomberg. Alan, as is often the case, you have missed the point. The picture is there to discredit LaPierre’s statement about good guys/bad buys. To illustrate that it is a lie and nonsense. I do not beleive that I even touched on gun control. I think the main point is that anyone who has a child should not feel good if we can’t somehow be confident that their children are safe there, and that safety isn’t going to involve their kids watch exchanges of gun fire, even if there are five ‘good guys’ for every bad guy. I likely agree with Alan that gun confiscation would be disaster, and I don’t think anyone is seriously pursuing it at this time. But for gun advocates to go from wanting not just freedom to own weapons, but basically wanting them everywhere is horrific. I think some states have legalized having guns in church, in bars and at work. Regarding schools, I see at least as much risk of a stressed out teacher who carries a gun to school panicking or in a fit of rage shooting a student as that same teacher being the ‘good guy’ that stops the next Adam Lanza. Introducing guns into more of our daily interaction can only cause normal confrontation, and arguments to have much more potential to turn into a gun fight and maybe a death or two. Our society is in serious trouble if the only we can be safe is to be in a state of MAD. Remember that? At the height of Cold War we lived with the doctrine of Mutually Assured Destruction or MAD. The peace was kept by the knowledge that if a confrontation spiraled out of control it meant the end of EVERYTHING. It worked, but is a balance of terror the best we can do between nations and individuals? 3. More insane laws like the right to guns at school or church will be passed in red states. No response at all to Sandy Hook would be better than those three I think. Obama should have pursued better mental health policy. That likely would help us as much or more the gun proposals; might have actually been enacted; and would have lead to guns in church. I think the only President of the US that could ever enact gun restrictions like limited magazine, with their limited benefit would be a conservative Republican. A conservative might never take that action of course, but I think he or she would not be under such suspicion that it was just the first step to confiscation, and you wouldn’t see the crazy reaction that Obama has summoned up. Thanks for the reblog bruce! In spite of his words lately, I don’t see guns as having ever been much of an issue for Obama. To my knowledge, he’s never proposed legislation. After Sandy Hook, any prez has to take to the pulpit and decry gun violence . . . . if anything, I think Obama fell down on the job. If he wanted something to happen he should have moved agressively immediately and loudly. He didn’t do that. As usual, he tossed it to the Dems in the Senate who have done basically nothing. And he makes some speeches . . .. nothing’s going to happen from DC. I think momentum will come, but it will come organically from the bottom. The group that is forming out of Sandy Hook is modeling itself after MADD (Mothers AGainst Drunk Driving) who were stunningly successful. Over 30 years, they completely reversed the cultural mindset about drinking and driving. We can’t change the Constitution, we can’t win the lobbying war, so the only thing we can do is change people’s minds. And MADD did it. Maybe these new follks can do it too. By the way feel free to remove my first comment. It basically is the same as my second. My point my briefly were that I think gun regulation will have only a marginal impact on violence. An organic movement is the best way to proceed. Any move from this President especially will stir up so much paranoia that it guns laws nationwide will get worse: legalized guns and church and so on. A conservative President would have the best (but likely not good) chance of enacting some sensible (and limited regulation), because he would have more trust among gun owners. It’s like Nixon the old cold warrior going to China with good results. Imagine the reaction if Jimmy Carter had tried the same thing (assuming Nixon hadn’t already made the opening). The next thing that popped up in our little talk was Switzerland, guns and why the f… you guys are so over the top violent. Methinks it doesn’t have as much to do with guns as you would like to think. The truth is the American culture is, for the most part, nasty violent. I think that probably would be a good place to start, rather than trying to ban magazines and semi automatic weapons. Afterall, the majority of your gun crime are handguns. T4T, I think you have touched upon a truth about us. We are indeed a violent country – we were born in war and a century of genocide, fought a terrible civil war within 70 years of signing our Constitution, held on to a large part of the pre-war culture for nearly another hundred years. And in fact, we have been at pretty much perpetual war from the very beginning. It’s much more than guns or mental health. The arguments about video games and Hollywood are, I think, nonsense. Those games and movies are worldwide phenomenon, not confined to our shores. Sometimes we forget (although this is somewhat true of Candada as well) that much of our country was frontier right up till the First World War. Its more than that. Its true we have similarities but when it comes to the degrees of violence and disconnect I believe you have much more. I think this definitely boils down to ideology of Capitalism. At its core it is about personal attainment not community. Its not too far of a leap to violence after you make that disconnect. In general, the countries that combine some forms of socialism with capitalism do seem to have slightly lower levels of violence. I think your idea on war doesn’t hold up when you look at many of the European countries and there much longer standing connection to war and oppression. I think it is as simple as money and power. I think Moe does have it exactly right, T4T, about the USA’s relative youth and bellicosity. Aside from the NRA meme so deeply embedded in our culture, just consider the ease with which we went to war twice in Iraq, in Vietnam, in Korea, in WW I, and in Cuba. The latter, the Spanish-American war stands out – it was really unnecessary, but avid volunteers, including the “Rough Riders” popped up all over the country for that adventure. Teddy Roosevelt famously called it “a splendid little war”. Now, with conscription a mere footnote of history, I fear that war is becoming perpetual. And who benefits from that? As in, who makes money from your wars? The idea behind it isnt violence, its money. Military/Industrial complex. Even General/President Eisenhower came to see it for what it was. Quite right, the U.S. is the #1 arms exporter in the world. But that’s beside the point, isn’t it? We were discussing culture I thought. No I did not miss the point. You missed my point. 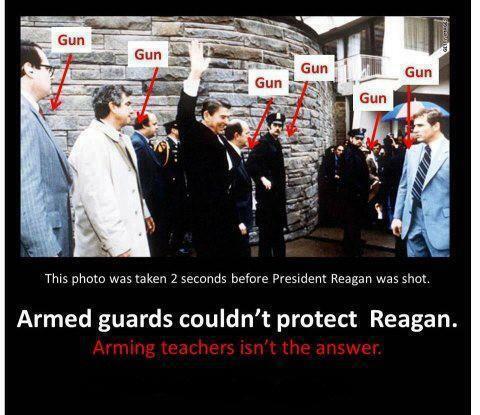 You took a failure of President Reagan’s armed security and applied it to the NRA’s solution to gun violence. My comment was to illustrate that the connection of Ronald Reagan’s shooting to disallowing armed guards in schools is not valid, unless you admit that having armed guards around high value targets such as US Presidents and Liberal big city mayors is useless. I don’t suppose you would care to say that school children are less valuable than Barak Obama? Do they deserve less? I know that is not a fair question. Well how about are they at least as valuable as Mayor Michael Bloomberg? Well maybe 20% as valuable as his Honor is? Bloomberg had 5 armed body guards at the US Conference of Mayors this last January. Can’t each school have even one? The principal distinction you are missing is the one between the two different likely threats, politically-motivated assassins and crazy people. The president requires armed SS protection principally for the former and it’s not as effective for the latter, which is the point. John Hinckley showed us that. The bad guy will always get the drop on the good guy, especially if he’s distracted by something, like trying to teach a lesson for example. Duh. I think an additional point would be the chances of someone attacking a president, especially if they were unprotected, is much higher than for a school in any town USA. At least so I pray as a parent. I think the side effects of armed guards in schools will be worse than any benefit. Consider you’d have a gunman in every school everyday, not in the case of the terrible, but rare tragedy. The question then becomes how confident are we that the guards won’t go crazy, over-react or otherwise kill one those they are supposed to protect? Anyway do I want the message to my child and others to be: the chance of violence in your school is so high you need to be in an armed camp? Guns in at least most schools (some inner city schools may be an exception) flunk any sanity test in my eyes! Even better, post one in every movie theater in your country. At least then you can say youre all in the processing of making jobs. This mostly beside the point, but one of the persons identified as having a gun is I think Mike Deaver, a Reagan staffer. I doubt he actually had a gun. see this and see what you think. You are arguing that armed guards do not work against crazy people. I find that to be an amazing statement. I argue that the Secret Service did infringe on Hinckley’s access to the President. This saved Reagan’s life and others . The time and proximity to the victims were limited during the incident. Compare that to the total freedom the Connecticut shooter had to kill. Again I find your logic incomprehensible. No Alan, I didn’t say that armed guards do not work against crazy people. I said they are “not as effective for (them)”. And you need to understand that protecting top government officials from politically-motivated violence is in a very different category from the random violence of the mentally unstable. There’s no way to achieve perfect safety and we shouldn’t be trying to. If that were the case we would all be driving cars at 35 m.p.h. maximum with huge puffy bumpers and items banned from airplanes would include ball point pens, keys, paper clips and all liquor. By the way, even though Charles Manson is locked up there are still plenty of crazies out there. You might want to keep your loaded AR-15 close by your bed at night. Correct statement “All it takes to stop a bad guy with a gun is a some good guys with bigger guns”. And wouldn’t it have been lovely if those good guyS had guns in that dark movie theatre? Circular firing squad! Great idea.